Sixteen years ago today I said "I do" to the most wonderful man and we began our walk together down the path of this wonderful life. Let's just say his batting average has gone down a bit. Happy anniversary! Very cute...the groom looks a bit Brad Pitt-esque now :) Have a wonderful celebration!! Happy anniversary! 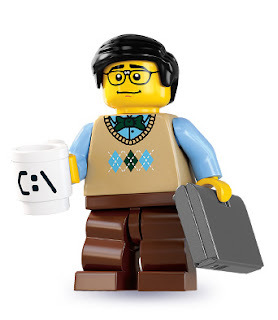 I just asked my oldest if we have that programmer mini-fig. As soon as she saw it she said "Hey, that looks like Daddy!" I guess it's easy to pick out the programmers. LOL! LOL!! I love that programmer! Especially the mug. :) My husband works as a Network Engineer/Systems Admin. and I think that mini-fig could work for him, too. Wishing you and your husband a very Happy Anniversary (again ;) ). I love it!! The "monkey boy" totally cracked me up... and the computer programer is perfect for Sean! Happy Anniversary!!! We are so blessed to have you and your beautiful family in our life! Love you all!! Maybe that's what computer programmer hides under his argyle sweater - a secret super monkey man identity. Those still waters run deep! Happy anniversary to a lovely couple, and many blessed years to come! Happy, happy anniversary! Darling cake. So sweet! Happy Anniversary! So glad you share your beautiful life with us! Aww! Happy, happy anniversary to you and your beloved! May God bless you abundantly throughout this next year of matrimony :) P.S. LOVE the monkey boy!!! Love the Brad Pitt comment!! !